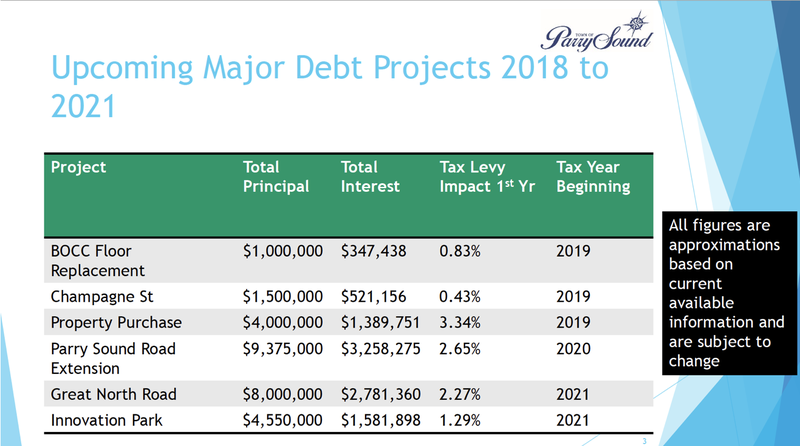 While the 2017 Budget is largely in the can, there are a few financial related issues that may be of interest to Town of Parry Sound ratepayers. In addition to the capital budget items defined in the 2017 Budget, the budget meeting on January 10th also unveiled some longer range capital expenditure possibilities. Possibilities is probably the best way to describe these capital expenditures. There is no agreement that these investments will be made, and if they are, there is no firm commitment as to when they will definitively arrive. The table below is taken from the January 10th budget meeting. A few initial thoughts on the planned expenses. BOCC Floor Replacement: Likes roads, facilities need ongoing maintenance and from time to time major investments. That’s why ice time isn’t free. Champagne Street: This may be related to plans for future development in the area, whether or not it is a casino. The street is so short that it’s hard to imagine it would cost $1.5 million to refurbish the street for it’s current users. This would be a major artery servicing a casino or a condo development. Property Purchase: $4 million, hmmm! I wonder where this might be. My sense is that it would be on the waterfront area between the Town Dock and Big Sound Marina. There are rumours that the OPP are planning a new facility off of the 400, and perhaps Service Canada and the MNR people are planning to leave. That might mean the Town has to come up with some cash to purchase the land so that these organizations can afford new facilities. But it’s only a guess. I don’t think that it relates to the former Shell or imperial Oil properties on the other side of the harbour, but its only my best guess. Parry Sound Road Extension: The connection to Oastler Drive (Old 69). This seems to be a critical element in the Town’s strategy to open up the south east side of Town for future development. It would be the major access route for a casino, and/or and Innovation Park, and/or industrial development of the properties on the Seguin side of the road that have made overtures to join Parry Sound. At the very least it will keep the Fowler salt trucks off Bowes Street. Great North Road: This is the stretch of road between Bowes Street and Champagne Street. It’s due for an update/upgrade. Innovation Park: This is a project discussed in general terms at an open meeting earlier in 2016. I understand that it would be located on Parry Sound Road across from the Weeks facility, another reason for the Parry Sound Road extension. There you have it, the near term thinking of the Town Council and Staff with regards to the the next phase of capital investments. Add up the figure and these investments are likely to add an additional 11% or so to your tax bills by 2021. It’s possible that the impact will not be so great if some of the older debentures are paid off in the interim. Add to that another 1.8% per year increase for the Infrastructure Reserve fund and you could be looking at 2021 Parry Sound taxes being about 20% higher than the 2017 tax levels. Add in a lowball estimate of a 2.5% annual increase for the usual inflationary and service improvements and you are looking at your tax rising by about 30% over the next 4 years. 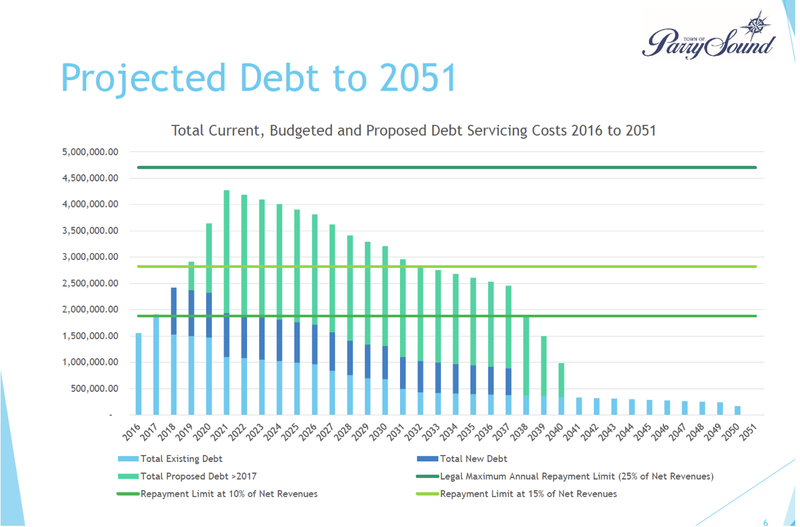 The chart below is from the January 10th presentation and summarizes the projected changes in the Town’s annual debt servicing costs if the proposed projects are undertaken. All of this suggests that the Town may be looking at a casino development as the answer to it’s continually increasing taxes. (Seven comes eleven, baby needs a new pair of shoes, or in our case roads). Right now Parry Sound pays about 3 times the municipal taxes of Seguin and Carling on an assessed value basis. That may stretch to a 4 times figure by 2021. If you have any thoughts about where this is headed you may want to speak to Council. Here is a link to the full January 10, 2017 presentation. Every person ‘in the global community’ requires an urban center where all necessary and Professional services are located, and that Urban center is supplied free of charge to the global community by the ratepayers of Parry Sound. This area tax inequity must be addressed by the Province before senior citizens can no longer afford to live in Town, unless houses of Prostitution are legalized, and operated in conjunction with the Casino’s, plus Church properties becoming taxable just for starters. I cannot see the inequity addressed in my lifetime, so I will just grin and bear it. My way of combating higher taxes being imposed? I just gave up driving a car and am saving a mint.